If you are wondering where to buy prebiotics, then you are one of the many who have discovered the benefits that prebiotics can provide. The popularity of prebiotics has made it possible for consumers to get their hands on these products much easier than around 10 years ago. A little more than a decade ago, prebiotics have not even made it to the attention of most of the researchers in the field of science, much less among food and supplement manufacturers. However, the discovery of the health benefits they can provide has led to more commercial products that contain prebiotics being made. Today, prebiotic supplements are competing against longer-established digestive health nutritional supplements and food options. Prebiotics were first identified in 1995 and given their name by Marcel Roberfroid. They are defined as non-digestible food ingredients that act as stimulants of good bacteria that are naturally present in the digestive system. They were also found beneficial when it comes to promoting or speeding up metabolism and lowering risks of certain digestive diseases. Studies about prebiotics continue to be conducted. So far, experts have confirmed that these food ingredients can be carbohydrates, dietary fibers or soluble fibers. They have been found to be beneficial to the immune system and can increase the body’s level of mineral absorption. Prebiotics are also believed to be effective in lowering a person’s risk for colorectal cancer, inflammatory bowel disorders, intestinal problems and even hypertension. Further studies have identified some of the sources of prebiotics, with fructan-containing plant species and food that contains inulin being some of the more common examples. Oligofructose and inulin, according to a number of studies, are the fructooligosaccharides the completely fit the definition given by scientists to prebiotics. So, where to buy prebiotics? A number of dietary supplements containing prebiotics are available in stores and on the Internet from manufacturers’ web sites. But if what you are looking for are natural sources, then you will have a long list to look into since a considerable number of plant species are said to contain these ingredients. Some of these species are soybeans, artichoke, yacon, unrefined barley, onion, garlic, kiwi, asparagus and a host of other vegetables and fruits. Food products that can be found in stores and groceries containing prebiotics have also become quite common, with cereals and bread being the primary examples. For those who do not have the patience to gather all these plant species or check food labels to identify which ones contain prebiotics, a nutritional supplement may be just the thing. Several brands of prebiotic supplements formulated for digestive health have been launched in the market in the past few years. However, these supplements are not created equal, despite sharing the same goals and some ingredients. One product that we can recommend is Xtend-Life’s Kiwi-Klenz. This is made from the purest kiwi fruit. It is different from other prebiotic supplements in a way that the seeds and the skin of the fruit were not thrown out during processing. The biggest percentage of prebiotics and enzymes in kiwi can be found in its seeds and skin. Xtend-Life has opted to include these parts in creating its supplement, as opposed to most kiwi-based prebiotic supplement makers who only use the pulp of the fruit. In addition, Kiwi-Klenz is made from all-natural ingredients, with phenolic compounds, enzymes and soluble fibers also part of its ingredient profile. 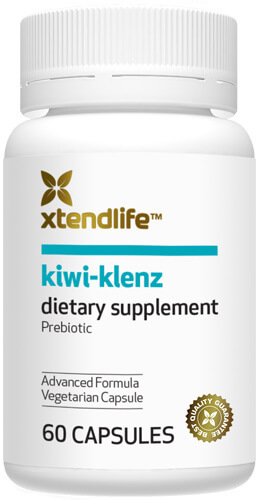 If you are seeking the answer to the question: where to buy prebiotics, your best option will be to go to the Xtend-Life web site and order Kiwi-Klenz from there to ensure quality, efficacy and prompt delivery.